Kettlercise® Instructor Group Fitness Course, ‘one piece of equipment, one goal’.....! EARLY BIRD BOOKING DISCOUNT: You can SAVE over £50.00’s using our ‘Early Bird Booking Discount’ (Normal Course Price £247 inc vat), book NOW to avoid disappointment and your investment is just £197 (inc VAT) PLUS you’ll receive ADDITIONAL Bonuses valued at £159.97 absolutely FREE if you book right now! But HURRY courses sell out FAST!. Finally, a kettlebell course that shows you how to integrate Kettlebell training in to your business in a proven, effective, results driven class format! Designed for personal trainers, fitness professionals, gym owners and health tour operators that want to add to their existing class timetable and put more money on their bottom line. More than just an exercise class Kettlercise® IS a complete ‘business in a box’! Kettlercise® it a one day course aimed at the personal trainer, gym instructor, health operator or gym owner that wants to teach an effective, proven, recognised Kettlebell course in a structured, proven, effective system. Kettlercise® integrates the traditional kettlebell in to a high volume, low intensity; all over body work out delivered in a 50 minute heart pumping, fat burning, and muscle toning class routine. This program delivers a lean, toned body without the look of huge bulky muscles………...fat burning just got real simple. The Kettlercise® programme follows the B.S.M. System, raising the metabolic rate skywards, ‘gaining a more bang for your buck’ complete all over body workout. As we all know, the body is a system of systems. Kettlercise® is no different. It’s systemised, it’s simple to follow, it’s capable of delivering lightning speed results and is THE conditioning tool that solves the mystery of bringing kettlebell training to the masses. You can take a group of clients who may have never even seen a kettlebell before and within minutes they are enjoying their first kettlebell training experience. Kettlercise® eliminates the need for clients to have 1:2:1 kettlebell sessions to learn the basics – they can just go straight in to attending a Kettlercise® class. Your clients will be astonished at the lightning speed results that kettlebells deliver and in lightening quick time. The Kettlercise® course covers a huge range of kettlebell exercises ranging from basic moves to more advanced techniques, allowing you to have more control over classes whilst tailoring them to its participants, from high energy pulse raises to being able to place extra emphasis on target muscle groups like abs, glutes, arms and thighs and all with maximum effectiveness. Never before has it been sooooooooo much fun to be a Kettlebell Instructor. I sound excited don’t I? Well that’s because I am! We trialled it, we tested it, we tweaked it, we tested it some more, then we polished it and now it’s in its finished format.....Welcome to Kettlercise®. #9 Reasons why you should put Kettlercise® in to your fitness timetable? In these challenging times of retaining and attracting gym members you need to stay ahead of your competition. When clients find something new, fresh and exciting that really works their loyalty to you can be extremely tested to say the least. #1. It’s easy for you to implement and market. #3. It’s simple and fun to teach and clients love it. #4. It’s a brilliant cross selling opportunity in to 1:2:1 PT sessions. #6. BIG REASON: Instant return on Investment. #7. It’s open to 90% of gym members. #8. It has its own supportive supplement range. results for your clients and members……FAST!. You can SAVE over £50.00's using our 'Early Bird Booking Discounts' (Normal course price £247), book early and your investment is just £164.17 (plus VAT) PLUS you'll receive ALL of the following Bonuses valued at £159.97 absolutely FREE if you book right now!. 1. Kettlercise® ‘Full Body Attack Program’. 2. Kettlercise® ‘Legs & Ab’s Blast Class’. 3. Kettlercise® ‘Upper Body Blitz Class’. Kettlercise® 90 Page course manual including FULL exercise descriptions and photos of ALL the exercises covered on the course. 12 Month’s Instructor Newsletter Subscription. Marketing Pack including: Kettlercise® class & Instructor logo’s, RKPS Certified Instructor logo’s, Poster & flyer images PLUS 12 Steps To Filling Your Kettlercise® Class, so great you’ll have clients just standing in line waiting to join. PLUS this (and you can't put a price on this one!!) Your Own Dedicated 'Kettlercise® Success Coach': Giving you that personal touch and helping you make more of Kettlercise® as it's designed to be...........a complete 'Business In a Box' and to help you grow your existing business. ...........all of the above included with your course fee PLUS much, much more!!. A couple of things you need to know. The Kettlercise® course is a very practical course and you’ll be training a lot throughout the day and a change of clothing will be required as you may sweat a little, in fact you may sweat a lot!......., you may experience muscle soreness during the course and for a few days afterwards (don’t worry this is normal). For this reason you may also want to bring the following with you in addition to extra gym kit: water and a protein fuelled lunch!!. KETTLERCISE® is a licensed, trademarked REPS (8 CPD Points) approved course and you can only conduct a course if your name appears on the Register of Kettlebell Professionals (R.K.P.S.). There is a membership fee payable yearly of £25.00. Need more info on Kettlebell Training? Click here to Read the Ultimate Guide to Getting Started with Kettlebell Training. Kettlercise® H.Core Group Fitness Programme. NEW!! 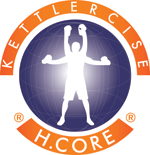 The Kettlercise® H.Core Course takes Kettlercise® to an all new level! This one day programme aimed at EXISTING Kettlercise® Instructors takes things to the next phase. - Principles of the Kettlercise® H.Core Class. - Who of your clients should and should not attend. - H.Core Kettlercise® mobility drills. - H.Core Kettlercise® Specific Warm Up. - You’ll be personally coached through the entire Kettlercise® H.Core class system. As always the Instructors are at hand to help should the need arise. × If you’re a person NOT interested in helping your clients become fitter, stronger and even leaner! ATTENTION: What EVERY Fitness Professional should know about Kettlebell Training for RESULTS! Training Athletes or Clients that need immediate results in as little as 4-6 weeks requires smartly crafted training programs that are scientifically proven for success! Done right, not only will these winning methods produce lightning fast results for your clients they can also propel you to the forefront of the fitness profession as THE go to trainer. You’ll be hard-pressed to find anybody else who has had as many successes with every single one of these methods as Guy has. I also don’t know anyone who has done so much with Kettlebells by being in the front line and deep down in the trenches over the past 14 years. He’s crafted more Kettlebell workshops, seminars, presentations, DVD’s, courses, editorials and fitness articles than anyone else I know! Seriously, there is NO other expert in the Kettlebell field and you shouldn’t have any doubt that he is THE guy to sit up and take notice of. He possesses real hands on experience, fact-based know-how and more information about this, including, yes, dare I say “secrets” that rise above that of any other alleged self-appointed Kettlebell gurus.....????? out there. NOW, FOR THE FIRST TIME…......He is consolidating all of this experience into a systematic explanation of everything he knows how to do to raise the results in any 1:2:1 training. HE CAN ABSOLUTELY, SUBSTANTIALLY IMPROVE YOURS AND YOUR CLIENTS RESULTS – like no one else can. IT’S THAT SIMPLE. Candidly, there’s a lot of SLOPPINESS, HASTE & WASTE in the way most trainers approach their One- To-One opportunities and efforts. Some even forego full client analysis entirely and foolishly leap straight in to training and “wing it” and EVEN WITHOUT writing a training program. Freakin’ STUPID. There IS a science to crafting ANY and EVERY kind of workout for intended effect. Fat loss, hypertrophy (muscle building), strength, power and speed………You need not risk guesswork! There are well-tested, well-proven structures and methods that yield top results and Guys ready to share them with you . Guy has created HUNDREDS of workout programs for himself, his clients and believe me when I say it’s ‘systematic’ AND he knows what needs to be in there, what needs to be done, AND what needs to be avoided and he knows what works and what definitely doesn’t work. My observations of almost every trainer’s workouts that they conduct with clients are that serious mistakes are being made; serious flaws are occurring and important drivers for success are omitted. Not so long ago I overheard a Personal Trainer asking his client these words: “So what do you fancy doing today?” The client responded: “I’m not sure what have you got planned?” It’s plainly obvious that the Trainer had NO idea or clue as to what he was going to do for the client’s session and quite frankly doesn’t deserve to be paid. The client isn’t the expert!! The Trainer should be paid for knowledge that leads to results and not the other way round.......it’s completely bizarre! Never before has anything like this been offered in the Kettlebell Training world. Guy has agreed to ‘ show his secrets’ of Kettlebell training for optimal results in 1:2:1 coaching. #1: share the ‘six locks you need to have the keys for to unleash performance’. #4: he’ll show you both Ascending and Descending Exercises according to your clients ability and to produce optimal results at lightening speed! #7: help you further develop your knowledge on the science of bell training in relation to: ‘the four things that you MUST have in any training program for anyone’ .....miss just one of these and it WILL hamper results. #8: you’ll discover Advanced BSM Programs for maximum fat loss! #10: PLUS Special BONUS Seminar: This is really two courses in one! 4 - How most trainers teach clients and what they really should do especially if they want to rise to the top of the profession – this is NOT just applicable to bell training! ........ALL of the above PLUS much, much more! How much difference will THIS course make to you as a trainer? I cannot even begin to tell you how much difference this course will make to you as a trainer just in the Bonus Seminar alone............ if you ‘go’ and ‘apply’ what you take away here...... it CAN literally change your income over night. I know when I learned these things it doubled mine! This is a jam packed two days of practical and REAL VALUE discussions of what’s working now in the Strength & Conditioning world. You’ll leave with a tool box full of written ‘done for you’ templates and not only that you’ll have the new ability to write your own for optimal performance should you choose to do so. I know you’re asking yourself “well is it not the same as Kettlercise®?” and my answer to that is NO it’s COMPLETELY different. The ONLY similarity is that we use kettlebells......that’s it! Kettlercise® is one type of training with Kettlebells. THIS delves deep into multiple training systems that just down right work when applied correctly. NO plans to do it elsewhere. We are only currently conducting this course here in Lancashire and have NO plans to do it anywhere else. However, there are loads of hotel chains within 5 mins of the Centre and the Centre is even just off the motorway so very easy to get here. Can you imagine the difference applying this information will make to your life .......even if you got one or two clients a month this course would pay for itself many times over in a very short period of time? Even if you’re not a personal trainer and have no intention of training professional athletes or clients, but just want to improve your own training it’s a complete no brainer. Now, when Guy and I sat down and he revealed all the information that he’s going to show and share and I was shocked ...............even down to the templates and ‘done for you’ programs .........he’s letting you take them all away with you. I remember having to jump on a plane, travel half way round the world, stay in a hotel for a week to learn this stuff and now he wants to give it away for FREE in the bonus seminar! This course has to be worth upwards of £995.00 for the two days and probably nearly the same for the bonus seminar, so a total value of £1990.00. So, I want to sell this course at a minimum of £995 but Guy over rules me and says “NO”! AND I’m even prepared to put my money where my mouth is by including a FULL MONEY BACK GUARANTEE! IF by the close of play on Day 1 and before the Bonus Seminars if you haven’t had MORE than value for money – I’ll give you a FULL REFUND, NO questions asked! p.s. We are NOT offering this training anywhere else in the country ONLY here and NO plans to do so! The Level 2 coaching program builds on both the Kettlercise™ system and the Level 1 coaching program. This 2 day course is particularly aimed at the Level 1 fitness professional who wants to progress to the Level 2 qualification that is aimed at trainers who are looking to work with semi-pro or pro athletes or even looking to enhance their existing training skills. This level is more focused on strength, speed and power and again is a very physically demanding course covering the more advanced kettlebell techniques with superior program design. In addition to the exercises we will show you ………. You’ll be able to: understand and apply the D.I.S.C. method of coaching to complex Level 2 kettlebell drills. You’ll be able to: practically apply and demonstrate the safety considerations of training with a kettlebell at an advanced level. You’ll be able to: demonstrate and instruct the correct techniques for all Level 2 Kettlebell exercises. You’ll be able to: integrate, write and implement advanced kettlebell training circuits in addition to other training methods and deliver to clients in the most effective training programs. You’ll be able to: analyse, instruct and correct a client’s mistakes, both method and posture. PLUS receive a full course manual including step by step photographs of each exercise. PLUS full detailed explanations of coaching points and common faults associated with each exercise. PLUS example circuits for you to use immediately with clients upon successful completion of the course. BUT PERHAPS MOST OF ALL.........................The R.K.P.S. strongly believe that the Level 2 Kettlebell Instructor course is THE most in–depth course covering THE widest range of exercises available to fitness professionals AND delivers THE most value for money available anywhere in the world today. We DO NOT store any private financial details on our servers. All prices are correct at the time of going to print. Kettlebell Seminars Ltd, R.K.P.S. (Register of Kettlebell Professionals) reserves the right to change its pricing at any time. All prices are inclusive of VAT where applicable. A contract is entered into with Kettlebell Seminars Ltd at the time of booking with either full or part payment. The contract includes a renewable licence fee. Payment is due strictly at the time of booking. If you wish to pay by credit card, we accept Visa, MasterCard, and debit cards such as Switch and Delta. You will receive your invoice via email when you place your order via our website. We regret that we cannot re-issue lost invoices. Post-dated cheques/postal orders will not be accepted and a booking is not deemed as a secured course place until the cheque/postal order has been cleared. All cancellations must be confirmed in writing either by post or email or within 7 working days of confirmation of the original booking and by the person that made the booking. In the unlikely event that you wish to cancel your original booking after acceptance by Kettlebell Seminars Ltd written notice of such wish must be forwarded to and received by Kettlebell Seminars Ltd unless otherwise agreed. If your course booking is made less than 7 working days before the actual course date, cancellation may not be made within this period. Kettlebell Seminars Ltd reserves the right in this instance to retain 100% of the course fee. If you are unable to attend a pre-booked course due to unforeseen circumstances a minimum of 7 days’ notice is required. Kettlebell Seminars Ltd has a waiting list of potential attendees for every course and 7 days’ notice is requested to allow your original course place to be filled. If you are unable to attend a pre-booked course you can transfer to another course date but please note that an admin charge of £35 is applicable per transfer. Transfer has to be taken within 6 months of the original booking date. Should transfer and attendance not be made within 6 months of original course booking will result in a complete loss of course fee. Failure to attend a Pre-booked course on the day, without notification will result in a complete loss of course fee. Kettlebell Seminars reserve the right to rearrange the course venue. You shall not have any claim against Kettlebell Seminars Ltd in respect of any loss or damage whatsoever consequent up on the Course failing (for whatsoever reason) to be held or the Course venue being or becoming wholly or partially unavailable for holding of the Course for whatsoever reason. Kettlebell Seminars Ltd reserves the right to re-arrange or postpone the course, or offer an alternative venue to within a reasonable distance of the original venue without liability. A necessary change in venue, dates of course, location or otherwise will not be a breach of contract and shall be binding upon all parties. It is the attendees responsibility to make all travel arrangements to a scheduled venue. Standard Annual Licence: A basic licence fee of £25.00 (or currency equivalent) is payable by an Instructor annually to remain a Registered Instructor and is a minimum requirement when attending any Kettlebell Seminars Ltd course. This is your responsibility and must be paid by you and as previously stated is a minimum requirement. The standard annual license fee forms part of the consideration for the purpose of the contract. A certificate of qualification will not be issued until the license fee has successfully been collected by Kettlebell Seminars Ltd. If a certificate is not held the individual will not be deemed a qualified Instructor. The license fee forms part of the consideration of the contract and failure to pay will be deemed as a breach of contract and all rights removed. NOTE: An SO MUST be filled in PRIOR to course day grading and forms part of your entered contract with Kettlebell Seminars Ltd. Failure to do so will result in the attendee not being allowed to grade and therefore failing the course. Privilege Monthly Licence: A Premium Monthly Licence fee of £19.97 (or currency equivalent) is payable by an Instructor reoccurring monthly and has many additional benefits over and above the Standard Annual Licence. This is your responsibility and must be paid by you as agreed. The Privilege License Fee forms part of the consideration for the purpose of the contract. A certificate of qualification will not be issued until the license fee has successfully been set up and the first month collected by Kettlebell Seminars Ltd. If a certificate is not held the individual will not be deemed a qualified Instructor. The license fee forms part of the consideration of the contract and failure to pay will be deemed as a breach of contract and all rights removed. IMPORTANT: ALL queries regarding licence fees please call Tel: 01282 698 698 PRIOR TO COURSE ATTENDANCE. Late Arrival: Delegates that arrive more than 30 minutes after course commencement may be refused entry. Kettlebell Seminars Ltd reserves the right in this instance to retain 100% of the Course fee.Kettlebell Seminars Ltd, R.K.P.S. reserves the right to refuse admission to any delegate who is deemed unsuitable for participation. Maximise your kettlebell learning experience with kettlebell instructor course. 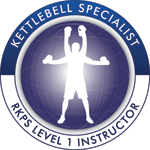 At R.K.P.S., we offer 3 levels of kettlebell training courses that will help you become a qualified kettlebells instructor. The official Kettlercise™ program follows the BSM System, raising your metabolic rate and brings Kettlebell training firmly into the 21st century with a bang!